An appropriate starting point for this introduction consists in providing the reader with a short definition of the adjectives “transcendent” and “transcendental”. All too often, these adjectives are mixed up (especially in the English-speaking philosophical tradition), and this leads to many misunderstandings. In a book entirely devoted to transcendental epistemology and its applications to physics, such misunderstandings could easily blur how each idea is perceived. This is why we must try to avoid them from the outset. “Transcendent” and “transcendental” somehow point towards opposite directions. True, both words share a common component of meaning, which is “exceeding experience”. But “exceeding” can be achieved in two antithetical ways. A transcendent object exceeds experience insofar as it allegedly exists beyond experience, as a remote (and intellectually reconstructed) external cause of experienced phenomena. By contrast, a transcendental structure exceeds experience because it is a background precondition of experience. Since transcendental structures concern the methods of access to experience, they have been thought of as pertaining to the subject of this experience by the classical tradition. But the latter notion of subject has nothing to do with psychology; it can rather be construed as a precursor of the cognitive notion of “access consciousness” in the sense of Ned Block. So, a transcendent object is supposed to wait for us “out there”, and is indifferent to our intervention. By contrast, transcendental preconditions prescribe rules of active definition and selection of phenomena in such a way that one may consider themas if they were appearances of an object. This is the difference between merely believing in the existence of objects, and being aware of the procedure through which we constitute them. 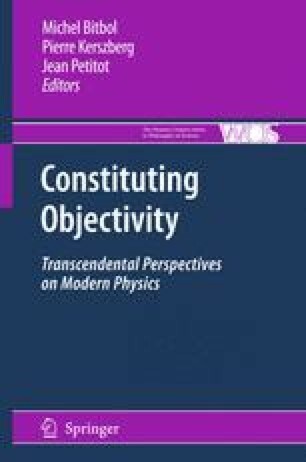 This also accounts for the difference between an ordinary and a critical definition of objectivity: objectivity in the first sense refers to that which possesses transcendent being; whereas objectivity in the second sense refers to what can be made valid for any one of us, independently of our situation, but not independently of the fact of being situated.